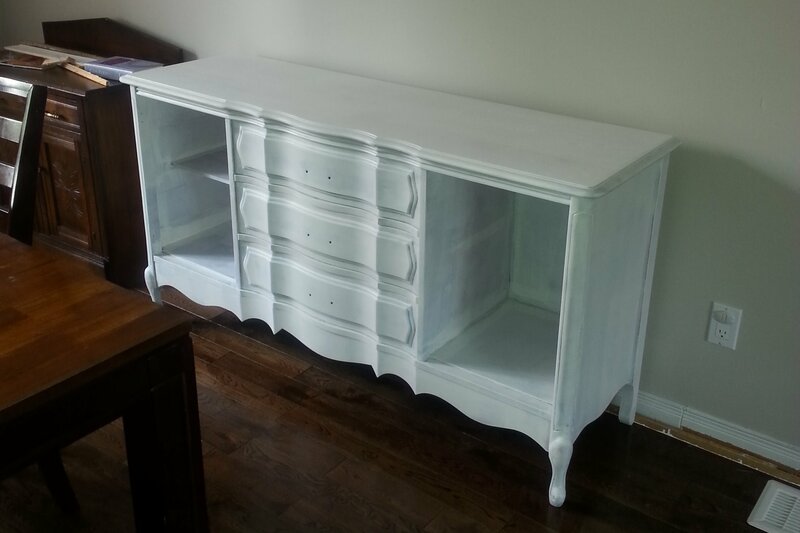 This french provincial buffet and hutch was an amazing kijiji find. I bought the set for $100, which I thought was a good deal even though they smelled horribly of cigarette smoke. I figured the worst thing that could happen was that if I couldn’t get the smell out of it I would bring it to the dump, and count it as a learning opportunity not to buy smokey furniture. First I cleaned the buffet using water, vinegar, and TSP. I tried my best not to use too much water because I didn’t want to damage the wood, but part of me just wanted to hose it down entirely. I also left it on the front porch for about two months hoping it would air out. After cleaning it as well as I could, I used the palm sander and 80 grit paper to get some of the finish off. Then I primed every inch of the buffet using Zinsser Bin shellac based primer and sealer that’s supposed to block the smoke smell. Already after a coat of primer it smelled a lot better and I was able to move it into the house! Tony and I wanted this piece to turn out as professional as possible, so we decided to spray it. Tony set up a spray booth in the garage, and used CIL smart3 furniture and cabinet paint. I had it tinted to the Benjamin Moore color Simply White. Tony did three coats of paint inside and out of the buffet using his paint sprayer. The finish turned out beautiful. It’s supposed to be a melamine finish, which is not too shiny, but still with a bit of gloss. And better yet, there is zero smoke smell!